Tseko Ratia, a man representing beleaguered communities surrounding Kao mine that is operated by the Storm Mountain Diamonds last week lost his job, allegedly for fighting for his people’s rights. Ratia, amid being an employee of the mine, is also a villager and chairperson of a liaison committee representing communities surrounding the mine, and his dismissal follows recent blockade and unrests that halted the mine operations for three days. Earlier this year, on February 8, a protracted conflict between the mine and the Kao communities resulted in the killing of Terene Pitae and left some villagers injured over a blockade on a road passing through the village to the mine. 75 percent of the mine shareholding is owned by Namakwa Diamonds, a South African Based company, while the 25 percent remainder is owned by the Lesotho government. The mine has been in operation since 2010 amid protracted conflicts with the villagers, reaching unprecedented level on the fateful February 8. In a recent interview, Ratia told MNN Centre for Investigative Journalism (MNNCIJ) about cat and mouse history between Kao communities and the mine, which he said resulted in him being victimised as their employee and eventually got fired. 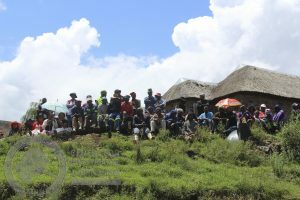 Aggrieved villagers listen attentively to the Rights Group, Transformation Resource Centre (TRC), following the villager’s tragic shooting on February 8, 2018. Ratia was charged and found guilty by the mine authorities of threatening to kill his fellow colleagues and for inciting violence against the mine. He has however contended the “real reasons” behind his dismissal was his resolve to find his community a fair compensation from the mine and erection of an access road to the communities. “My dismissal is meant to blame me for the entire mine’s problems and also to cover-up and suppress the Kao community’s grievances by labelling me a criminal,” said Ratia. Ratia said he was fired because he had dared to speak out during a meeting attended by the mine authorities, Ministry of Mining representatives and the community liaison committee on April 11. He had told the meeting that the community is aggrieved over houses and fields destroyed by waste from the mine. “At that meeting, I also blamed the mine for the deaths of Terene and one villager’s unborn child whose mother could not be rushed to the hospital due to lack of access roads. “Then, I told the mine representatives that if our grievances were unresolved more deaths shall come. “I was referring to the fact that more of our people shall die due to lack of access to basic services like health care. Many would die of illnesses that could have been cured or prevented if there were road for ease of travel to clinics,” said Ratia. Ratia told MNNCIJ it was that statement he made blaming the deaths of community members to the mine that landed him into trouble. He said his statement was twisted and charges were preferred against him that related to work stoppage for three days at the mine. According to mine charge sheet, copy seen by MNNCIJ, Ratia was charged with contravening the mine’s Disciplinary and Grievances Policy and Procedure by “threatening violence and alternatively breach of duty of good faith which undermines the trusts relationship between the Company and yourself (Ratia)”. The charges further read: “…on or about 11 April 2018, at a meeting held between SMD, members of the Kao community committee and … Ministry of Mining, you threatened violence to the persons present at the meeting, which threats included threats to the loss of lives”. Further charges against Ratia reads: “You are charged with contravening clause on intimidation or incitement or violence in that on or about 25 April 2018, by intimidating and or inciting fellow employees, and or threatening employees, you assisted in causing work to stop at the processing plant”. Ratia was later found guilty and fired from the mine on May 9 following a disciplinary hearing, he described as a kangaroo court formed to silence the Kao community’s leadership demands to the mine. A few days prior to Ratia’s dismissal, a memo addressed to all mine employees and contractors, seen by MNNCIJ, bearing both signatures of the mine’s Corporate Chief Executive Officer Mohale Ralikariki and Operations Chief Executive Officer Andrew Hobkirk, announced the mine was doing “something” about the events that led to work stoppage from 25-27 April. The memo, Ratia said was penned to orchestrate a fitting environment for the witch-hunt against him. The memo reads: “As you know the situation in the communities around Kao remains tense. The Police are still keeping a significant presence on the mine, and management will ensure that the safety of our people remains the highest priority”. The memo further noted that: “Very serious criminal acts by certain individuals were committed during this period, including by some of our employees. As we know, this country has well-established legal system that protects the rights, safety, security and interests of its people and institutions. “There are therefore consequences to such criminal behaviour, and we appeal to you, our employees and contractors, to cooperate in any way possible to assist us and the authorities in dealing with the situation. Please do not allow a few people to jeopardize your job and future”. On relations with the Community, the mine said in the memo: “Management and the shareholders remain committed, as it has always been, to engage and add value to the communities around Kao. “The current situation is hampering progress, mainly due to the difficulty for us to have access to the community for meaningful discussions to take place with the various groups and individuals. “We were in the process of doing an in-depth need analysis, which will ensure we are involved in the real needs of the community, rather than ad-hoc demands or perceived needs. We will keep engaging with them and hopefully make progress soon. “It is the duty of all to convey the message through to the members in the community. We have to get beyond all the misinformation and misperceptions created by certain individuals, and ensure the correct information reaches each community member”. The loss, the mine said, “…obviously also wiped out potential employee incentives in different sections”. Ratia alleged his dismissal was long awaited as his fellow community members working in the mine are also constantly ill-treated by the mine. He said any attempts to stand against the mine operations are always frustrated by involvement by the police. “The police seem to be on suppression of our community as they are always ready to be deployed to assist the mine whenever we try to mount pressure on the mine to address our grievances,” he said. Another long-standing disagreement between the community and the mine, according to Ratia, concerned their fields and communal grazing land compensation. He said the compensation was biased and lacked transparency in that some people were being compensated on the rates of projected beans harvest while others on the projected maize harvest, with the former valued higher than the latter. He added the projections were flawed as they assumed an individual farmer would plough the same crop (beans or maize) throughout the projected period, which is normally not the case. Ratia said these differences caused a lot of confusion among the community members as those whose compensation was based on beans prices were getting more money than those whose compensation was based on maize crop even if the maize crop based had larger fields due to the higher prices of beans. Addressing the parliament’s Natural Resources Portfolio Committee meeting recently, Ralikariki said the mine has been unable to communicate with the community for several reasons but emphasised the mine is committed to work with the community. Ralikariki told the committee the mine inherited community grievances that were never addressed when the past miner was liquidated. Ralikariki said the mine is working on the best compensation formulae for the community agricultural land and grazing land. He however said an internal decision had already been reached to compensate all members of the community at same rates using same crop basis to avoid conflicts. On relations with the community Ralikariki admitted the relations continue to be antagonistic, adding the mine was ready to bury the hatchet. MNNCIJ is still waiting for a response to questions send to Ralikariki concerning Ratia’s dismissal and way forward on relations with the community.